Fashion trends come and go but some of them are everlasting. Check out Nigerian George material styles for 2019 to keep your stylish self updated to old but gold clothing made of George material. We all know that Africa is a country full of contrasts, as it contains and combines numerous cultures and ethnicities, creating sheer beauty in every aspect of the continent's culture, including clothing; which is a very important element of culture not just in Africa, but all the world. It is particularly interesting how George material is associated with Nigeria, as very few know that this material was originally imported from India. That is why it tooks a lot like traditional Indian fabrics. African styles are recognizable for their brightness, crazily attractive geometric prints, high quality material such as silk, cotton, satin and etc. That is why George material was welcomed into Nigeria. This material is common for making clothes in many African countries. George material is characterized as a cotton fabric with bright highlights on it. The colors are usually diverse, but the most widespread option among Nigerians are the ones with golden embroidery. George material can also be made of raw silk, which makes it more expensive and rare. Such material is often used for celebrations and special occasions. Many ladies prefer their outfits to be made out of George for their weddings, graduations and other days they have to look flawless. Every year, there is a new collection of fabrics presented to diversify the addicts' wardrobes. So what does 2019 have for the fashionable ladies? 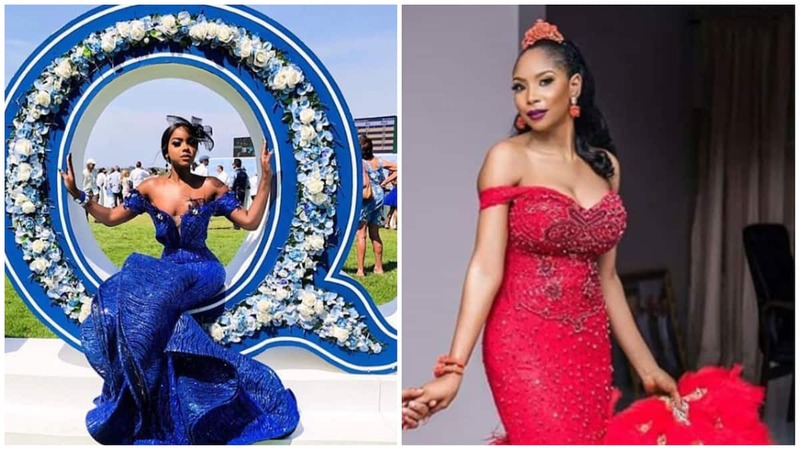 While the fashion trends in terms of Nigeria George material styles have not changed that much this year, there are still all these little details one should consider when picking their looks for the year. For instance, one of the fashion tips this year is to be a little bit extra with the jewels that cover your dress. You can always buy something with plain material style and then, when you are finishing up with your look, add big brooch, it would look even better when there are two or more. When attaching new decorations to your look, mind that George material is super delicate and needs to be taken care of. Quality George material is not a cheap treat. George latest material this year are about rich colours and sequins (blue, purple, red, gold etc.). If you want to show off your long legs and your smooth skin, the best option is to choose a short gown. Material style for short gowns does not differ. Slim dresses have always been in trend and there is little chance they will go away any time soon. All that said, go for whichever George material style you like most. As long as you feel comfortable and beautiful in your outfit, nothing else should matter.